The Company was incorporated on September 1, 2005 in the State of Wyoming under the name Ace Lock & Security, Inc. and on March 3, 2007 changed its name to Element92 Resources Corp. The Company is an Exploration Stage Company, as defined by Statement of Financial Accounting Standard ( SFAS ) No.7 Accounting and Reporting by Development Stage Enterprises . The Company s principal business plan is to acquire, explore and develop mineral properties and ultimately seek earnings by exploiting mineral claims. The Company s major activities are the acquisition and exploration of mineral interests and the production there from. The recoverability of amounts shown for mineral interests and their related deferred exploration expenditures is dependent upon the discovery of economically recoverable reserves. The Company does not generate sufficient cash flow from operations to adequately fund its exploration activities, and has therefore relied principally upon the issuance of securities for financing. The Company intends to continue relying upon the issuance of securities to finance its operations and exploration activities to the extent such instruments are issuable under terms acceptable to the Company. The Company s financial statements are presented on a going concern basis, which assumes that the Company will continue to realize its assets and discharge its liabilities in the normal course of operations. 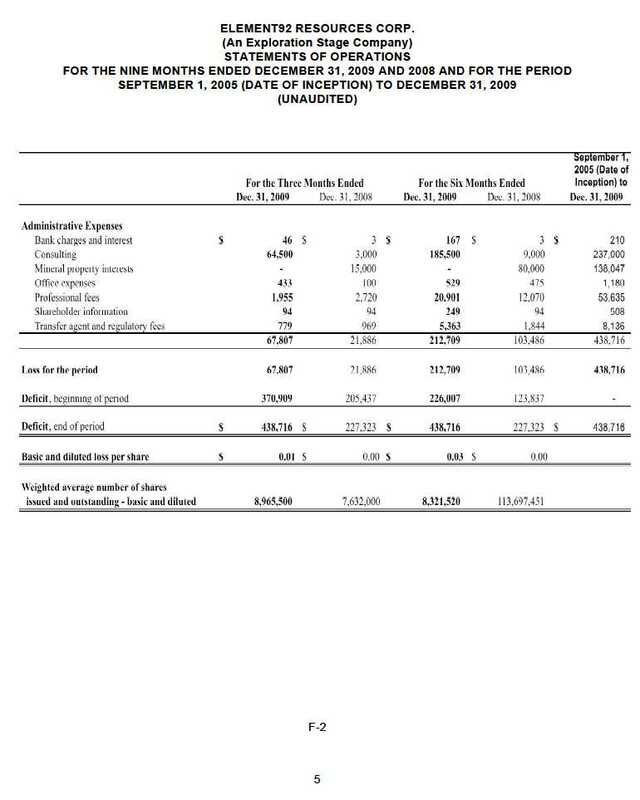 As at December 31, 2009, the Company has a working capital deficit of $26,516 and has incurred losses totaling $438,716. If future financing is unavailable, the Company may not be able to meet its ongoing obligations, in which case the realizable values of its assets may decline materially from current estimates. The Company plans to improve its financial condition by obtaining new financing. These financial statements and related notes are prepared in conformity with accounting principles generally accepted in the United States and are expressed in U.S. dollars. The Company's fiscal year-end is March 31. The preparation of financial statements in accordance with United States generally accepted accounting principles requires management to make estimates and assumptions that affect the reported amounts of assets and liabilities at the date of the financial statements and the reported amounts of revenue and expenses in the reporting period. The Company bases its estimates and assumptions on current facts, historical experience and various other factors that it believes to be reasonable under the circumstances, the results of which form the basis for making judgments about the carrying values of assets and liabilities and the accrual of costs and expenses that are not readily apparent from other sources. The actual results experienced by the Company may differ materially and adversely from the Company's estimates. To the extent there are material differences between the estimates and the actual results, future results of operations will be affected. The fair values of financial instruments, which include cash, accounts payable and due to related parties were estimated to approximate their carrying values due to the immediate or short-term maturity of these financial instruments. The Company is not exposed to significant interest rate, currency exchange rate or credit risk arising from these financial instruments. The Company is primarily engaged in the acquisition and exploration of mining properties. Mineral property exploration costs are expensed as incurred. Mineral property acquisition costs are initially capitalized when incurred using the guidance in EITF 04-02, Whether Mineral Rights Are Tangible or Intangible Assets. The Company assesses the carrying costs for impairment under SFAS No. 144, Accounting for Impairment or Disposal of Long Lived Assets at each fiscal quarter end. When it has been determined that a mineral property can be economically developed as a result of establishing proven and probable reserves, the costs then incurred to develop such property, are capitalized. Such costs will be amortized using the units-of-production method over the estimated life of the probable reserve. If mineral properties are subsequently abandoned or impaired, any capitalized costs will be charged to operations. The Company computes net income (loss) per share in accordance with SFAS No. 128, "Earnings per Share" which requires presentation of both basic and diluted earnings per share (EPS) on the face of the income statement. Basic EPS is computed by dividing net income (loss) available to common shareholders (numerator) by the weighted average number of shares outstanding (denominator) during the period. Diluted EPS gives effect to all dilutive potential common shares outstanding during the period using the treasury stock method and convertible preferred stock using the if-converted method. In computing diluted EPS, the average stock price for the period is used in determining the number of shares assumed to be purchased from the exercise of stock options or warrants. Diluted EPS excludes all dilutive potential shares if their effect is anti-dilutive. Shares underlying these securities totaled 9,060,000 as at December 31, 2009 (7,656,000 as at March 31, 2009). On March 30, 2007, the Company was granted an option to acquire a 100% interest in mineral claims located in the Huddersfield Township and Clapham Township, in the Province of Quebec, Canada. Under the terms of the option agreement, the Company was to make cash payments of US$45,000 in various stages as follows: US$10,000 on execution of option agreement (paid), US$15,000 on or before April 30, 2008 (paid); and US$20,000 on or before November 30, 2009. The Company was also to issue 1,500,000 shares in various stages as follows: 500,000 common shares upon execution of option agreement (issued), 500,000 common shares on or before April 30, 2008 (issued); and 500,000 common shares on or before November 30, 2009. As of December 15, 2009, following discussions between the Optionor and the Company and based on the progress of the Company, the Optionor has agreed to forgive both the outstanding cash payment of $20,000 and the issuance of the 500,000 shares. The Company must incur exploration expenditures of not less than US$10,000 or US$1,250 per claim on eight of its claims, on or before November 30, 2008 (completed) not less than $7,500 on the remaining six claims on or before February 28, 2010 and not less than US$21,000 on all fourteen claims on or before November 30, 2010,. Exploration expenditures incurred any date in excess of the minimum required to be incurred by such date to maintain the Option interest, shall carry forward to the following period. If any of the minimum exploration expenditures have not been incurred for the immediately preceding year, the Company may maintain its interest in the claims by paying the deficiency in cash to the Optionor within two months of the close of the period in which the deficiency occurred, and such payment shall be deemed to be exploration expenditures incurred by the Company for the purposes of the option agreement. The Company is currently authorized to issue 100,000,000 shares of common stock with a par value of $0.001 per share. All shares have equal voting rights and have one vote per share. Voting are rights are not cumulative and, therefore, the holders of more than 50% of the common stock, if they choose to do so, elect all of the directors of the Company. During the year ended March 31, 2006, the Company issued 5,000 shares for cash proceeds of $5. The shares were subsequently split 1,000 for 1, thereby at March 31, 2006 the Company had 5,000,000 shares of common stock outstanding. During the year ended March 31, 2007, the Company issued 500,000 shares for consulting services at a deemed price of $0.01 per share for total consideration of $5,000. The Company issued 50,000 shares for accounting services at a deemed price of $0.10 per share, for total consideration of $5,000. As well, the Company issued 500,000 shares at a deemed price of $0.10 per share for property acquisition. During the year ended March 31, 2008, the Company raised $78,200 from the sale of shares at $0.10 per share, a total of 782,000 shares were issued. The Company issued 200,000 shares at a deemed price of $0.10 per share for consulting fees. The Company issued 20,000 shares at a deemed price of $0.10 per share for referral fee with regards to the Quebec property option. During the year ended March 31, 2009, the Company issued 500,000 shares at a deemed price of $0.10 per share as per the property acquisition agreement dated March 31, 2007. On September 30, 2008, the Company settled $20,000 of debt at a deemed price of $0.25 per share. The 80,000 shares were issued to a director of the Company. 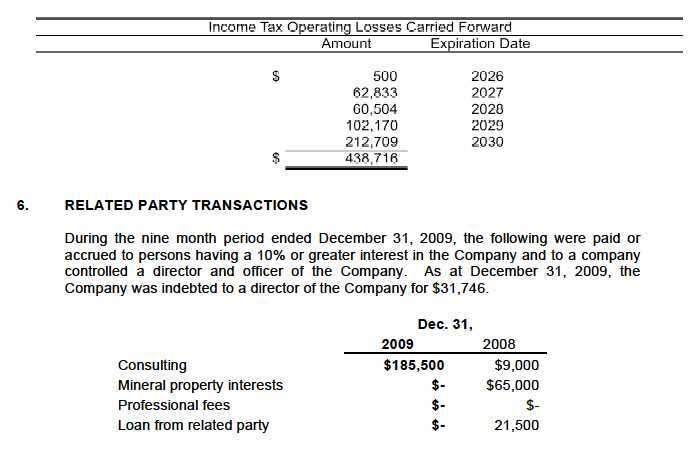 On December 31, 2008, the Company settled $3,000 of debt at a deemed price of $0.25 per share. The 12,000 shares were issued to a director of the Company. On March 31, 2009, the Company settled $3,000 of debt at a deemed price of $0.25 per share. The 12,000 shares were issued to a director of the Company. During the nine months ended December 31, 2009, the Company issued 12,000 shares at a deemed price of $0.25 to settle $3,000 of debt (due to an administrative error, shares to be issued for settlement of debt were not issued. The Company has rebooked the payable and decreased share capital). On July 30, 2009, the Company issued 950,000 shares, at a deemed price of $0.10 per share, for services rendered by a corporation held by a director of the Company. On September 15, 2009, the Company issued 200,000 shares, at a deemed price of $0.10 per share, for non-payment of advanced funds. On November 4, 2009, the Company issued 230,000 restricted shares to an employee and owner of more than 10% of the Company s issued and outstanding shares for services. All shares were issued to directors of the Company. Current tax laws limit the amount of loss available to be offset against future taxable income when a substantial change in ownership occurs. Therefore, the amount available to offset future taxable income may be limited. The provision for income taxes differs from the result which would be obtained by applying the statutory income tax rate of 34% (2008 34%) to income before income taxes. On March 1, 2009, the Company entered into a consulting agreement with Capital Path Securities, LLC, ( CPS ) of Rocky Point, New York. CPS will be the Company s investment banker providing advice relating to corporate finance matters, developing a network of traders making markets in the Company s securities, presenting the Company to broker dealers interested in retailing the Company s securities, and other financial consulting and/or investment banking services as needed by the Company. Services are payable when rendered by CPS, a retainer of $5,000 has been paid to CPS. The retainer will be increased upon additional financing or generation of income. On December 1, 2009, the Company reviewed the Executive Services Agreement (the Agreement ) dated February 28, 2007, between the Company and Geoffrey Armstrong, an Officer and Director of the Company (the Executive ). As of December 1, 2009, the Company has increased the monthly remuneration of the Executive to $5,000 per month and extended the Expiration Date of the Agreement from February 28, 2012 to February 28, 2014. Although Mr. Armstrong abstained from voting on the changes, the transaction cannot be considered as an arms length transaction. On January 26, Daniel Mckinney, a Director of the Company, loaned the Company $2,000. This amount is in addition to previous loans totaling $21,500. These loans have not been repaid. On January 25, 2010, the Company announced that it had executed a sales and purchase agreement to acquire three gold mines in Shandong Province, China. The Company is acquiring the rights to control two producing gold mining properties and one gold deposit by the issuance of 90 million newly issued restricted shares. The closing is expected to occur on or before March 31, 2010. The agreement is between the Company and Tam Kam Ming together with Gold Vanguard Limited, owners of Joyous Fame International and its assets, which includes the mining properties. Also on January 25, 2010, the Company signed a consulting agreement with Dennis E. Burns of Tiffen, Ohio, to provide investor relations services. Mr. Burns will work as an independent contractor. The agreement will terminate January 24, 2011. Compensation for Mr. Burns includes a monthly fee of $3,000, plus expenses, a grant of 200,000 restricted common shares issued at the signing of the agreement and a grant of an additional 300,000 restricted common shares following 120 days of satisfactory service. The agreement expressly states that Mr. Burns will not engage in any direct stock promotions. On February 1, 2010, the Company filed a Schedule 14C Preliminary Information Statement pursuant to its decision to amend the Company s Articles of Amendment in order to increase the Company s authorized capital from 100,000,000 common shares to 1,000,000,000 common shares. The earliest date on which the amendment to our Articles of Incorporation may be affected is February 15, 2010. We were incorporated in the State of Wyoming as a for-profit company on September 1, 2005 and established a fiscal year at the end of March 31. Element92 Resources was incorporated under the laws of the State of Wyoming as Ace Lock & Security. On March 5, 2007, we filed a Certificate of Amendment with the Wyoming Secretary of State changing our name to Element92 Resources Corp. and increasing our authorized capital to 100,000,000 common shares. Element92 Resources Corp. is a start-up, exploration stage company engaged in the search for commercially viable minerals, most notably, uranium. We have optioned 14 mineral claims in the Province of Quebec, Canada. We have no property other than an option to acquire the claims. There is no assurance that a commercially viable mineral deposit exists on our claims or can be shown to exist until sufficient and appropriate exploration is done and a comprehensive evaluation of such work concludes economic and legal feasibility. The Company will proceed only if minerals are found and their extraction be deemed economically feasible. Required work program on 6 Claims minimum expenditure $1,250 per claim to be undertaken prior to February 27, 2010. Our plan of operation for the twelve months following the date of this Form 10-Q filing is to complete the second stage of our exploration program prior to February 27, 2010 on the remaining 6 optioned mining claims. The work will consist of grid emplacement, concentrated geological mapping and sampling and geophysical surveys. We estimate that the cost of this program will be approximately $9,750. There are no additional significant capital equipment purchases expected during the next 12 months. over and above planned requirements as currently comprised within the Company's business plan. The Company will add 2 part employees to managed the short term work program on the six claims noted above. We continue to seek a Joint Venture partner to assist is to explore and develop our claims. The Company will undertake an additional equity offering within the next 12 months. In this case, the use of proceeds would center on the acceleration of work on the claims and meeting our general operating costs. We have not earned any revenues from the time of our incorporation on September 1, 2005 to December 31, 2008. We do not anticipate earning revenues unless we enter into commercial production on the optioned claims, which is doubtful. We have not commenced the exploration stage of our business and can provide no assurance that we will discover economic mineralization on any of the claims, or if such minerals are discovered, that we will enter into commercial production. The Company recognized a net loss of $67,807 the period compared to $21,886 for the same period in 2008. 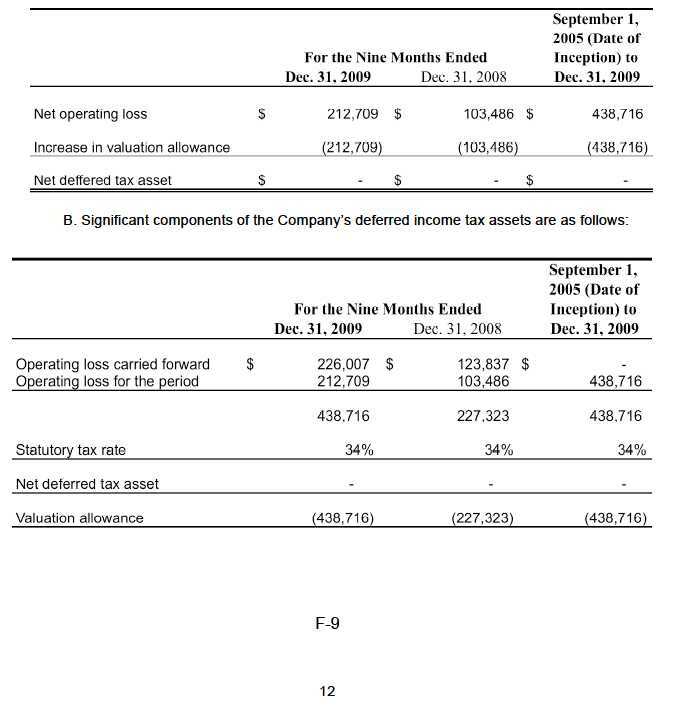 From inception through December 31, 2009, the Company recognized a net less of $438,716. Expenses for the quarter were comprised of costs associated professional service fees of $1,955, $433 for office expenses, transfer agent fees of $779, shareholder information fees of $94 and consulting fees of $64,500. We currently do not have enough cash to satisfy our minimum cash requirements for the next twelve months. The Company's financial statements have been presented on the basis that it is a going concern, which contemplates the realization of the mineral properties and other assets and the satisfaction of liabilities in the normal course of business. The Company has incurred losses from inception to December 31, 2009. The Company has not realized economic production from its mineral properties as of December 31, 2009. These factors raise substantial doubt about the Company's ability to continue as a going concern. differ materially from these estimates under different assumptions or conditions. We continue to monitor significant estimates made during the preparation of our financial statements. Pursuant to Rule 13a-15(b) under the Securities Exchange Act of 1934 ( Exchange Act ), the Company carried out an evaluation, with the participation of the Company s management, including the Company s Chief Executive Officer ( CEO ) and Chief Accounting Officer ( CAO ) (the Company s principal financial and accounting officer), of the effectiveness of the Company s disclosure controls and procedures (as defined under Rule 13a-15(e) under the Exchange Act) as of the end of the period covered by this report. 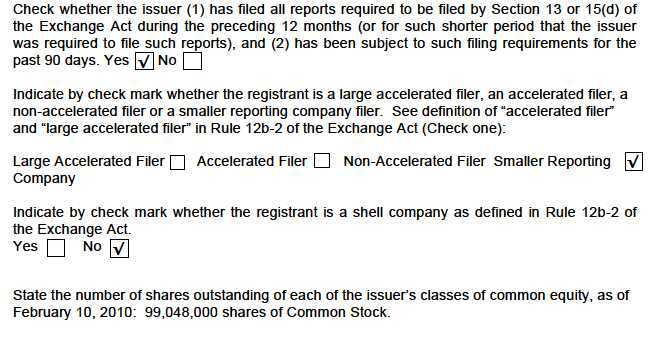 Based upon that evaluation, the Company s CEO and CAO concluded that the Company s disclosure controls and procedures are effective to ensure that information required to be disclosed by the Company in the reports that the Company files or submits under the Exchange Act, is recorded, processed, summarized and reported, within the time periods specified in the SEC s rules and forms, and that such information is accumulated and communicated to the Company s management, including the Company s CEO and CAO, as appropriate, to allow timely decisions regarding required disclosure. Internal control over financial reporting is a process to provide reasonable assurance regarding the reliability of consolidated financial reporting and the preparation of financial statements for external purposes in accordance with U.S. generally accepted accounting principles. There has been no change in the Company s internal control over financial reporting during the quarter ended December 31, 2009 that has materially affected, or is reasonably likely to materially affect, the Company s internal control over financial reporting. The Company s management, including the Company s CEO and CAO, does not expect that the Company s disclosure controls and procedures or the Company s internal controls will prevent all errors and all fraud. A control system, no matter how well conceived and operated, can provide only reasonable, not absolute, assurance that the objectives of the control system are met. Further, the design of a control system must reflect the fact that there are resource constraints, and the benefits of controls must be considered relative to their costs. Because of the inherent limitations in all control systems, no evaluation of the controls can provide absolute assurance that all control issues and instances of fraud, if any, within the Company have been detected. Management conducted an evaluation of the effectiveness of our internal control over financial reporting based on the framework in Internal Control Integrated Framework issued by the Committee of Sponsoring Organizations of the Treadway Commission. Based on this evaluation, management concluded that the company s internal control over financial reporting was effective as of December 31, 2008. Currently we are not aware of any litigation pending or threatened by or against the Company. On November 2, 2009, the Company issued 230,000 restricted common shares to AE Financial Management Ltd., for services, at a deemed price of $0.25 per share. 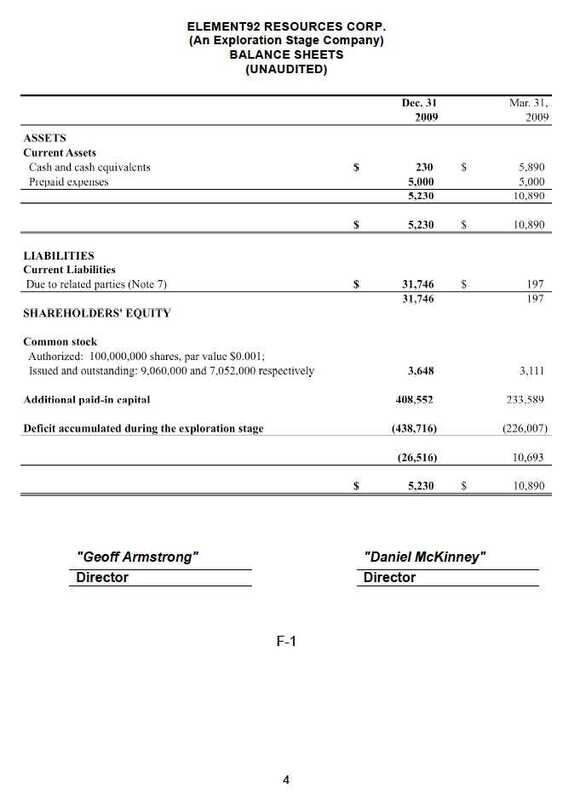 AE Financial Management Ltd. is a British Columbia, Canada company owned as to 100% by Edward Low, an affiliate of the Company by virtue of the fact that he is the owner of more than 10% of the Company s issued stock. The shares were issued in accordance with Regulation S of the Securities Act of 1933. (1) Incorporated by reference. Filed as an exhibit to the Company's Form 8-K dated January 27. 2010. On January 25, 2010, the Company filed a Current Report on Form 8-K (Entry into a Material Definitive Agreement) reporting that it had executed a sales & purchase agreement to acquire three gold mines in Shandong Province, China. The Company is acquiring the rights to control two producing gold mining properties and one gold deposit by the issuance of 90 million newly issued restricted shares. The closing will be reported by the Company upon completion. The agreement is between the Company and Tam Kam Ming together with Gold Vanguard Limited, owners of Joyous Fame International and its assets.